And Now, a Word From Our Sponsor…. Oh the stories I can tell…and will! Coming soon, tales of our adventures through the Black Hills of South Dakota. I just had to share this teaser trailer though, have you ever see a buffalo up close and personal? 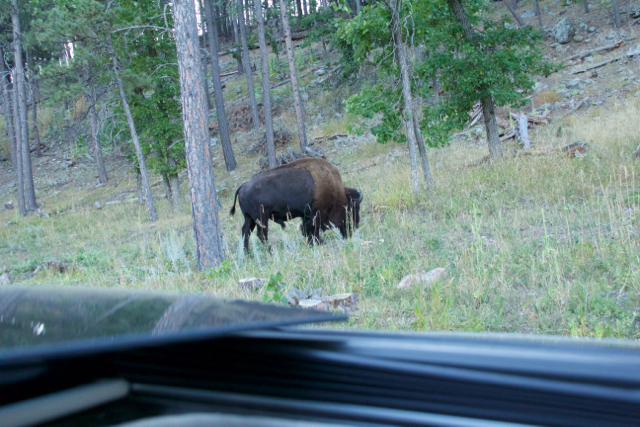 Twenty feet from your vehicle, in the wild, up close and personal? They are MASSIVE. Ginormous. Like ‘holy crap’ huge. So Mike kept one foot on the gas, ready to peal out in case it turn and moved toward us while I peeked out the top of the car with the camera. Hope your adventures are just as grand! I recently attended the “White Coat Ceremony” for my niece as she started her first year of medical school. If you’ve never heard of it, don’t feel bad, neither had I and I’m a nurse by background. It’s the formal ceremony that kicks off freshman year for med students. It was started about 20 years ago, and is now done at 95% of medical schools in the country. They have speakers who attempt to be both humorous and inspirational, followed by the parade of incoming students who cross a stage as their names are announced, to don a white coat, shake hands with instructors, then accept a reflex hammer and stethoscope (both of which were kindly donated by local businesses), before exiting stage left to the applause of family and friends. I did notice something during this ritual, this rite of passage. There was an interesting selection of attire with these young women (some younger than others). There were some wearing very short, tight skirts, some in business professional dresses or skirts and some in business or business casual pants. The footwear varied as well, from sturdy but supportive Doc Martens, to flats, and stilettos. Wait, what? Mini skirts and stilettos at a formal ceremony for medical school? Granted, you can’t, and perhaps shouldn’t, judge the book by it’s cover, but at the same time, get real. These are the students that are the going to be the doctors that take care of you and I.
I had this immediate mental picture of a lovely young woman with long, straight hair flatironed to perfection, walking into a room just after her instructor and student colleagues, wobbling on 4″ stilettos, each step announcing her arrival and subsequent departure through the click of those heels on the tile floors. She misses the first few things the instructor says because she has to take such small steps in those heels, and is always trying to play catch up. At the end of the day she can’t figure out why her whole day is a blur and just runs on and on and on….none of it makes sense, not one patient stands out. Ah, but you see, it’s ok, because she looked cute in those shoes…they made her legs look awesome. Frankly, when I’m laying on a cart in an emergency room at 2 a.m. clutching my chest, wondering if I’m going to die, that’s what I’m thinking too…”her legs look awesome”….um, not so much. Oh well, they’ll always have a reflex hammer and stethoscope. Old enough to know better, young enough to still want to do it anyhow. A spirit of bravado with skin of a coward, but trying to change that little by little. Beth is a domestic goddess, musical songstress, perpetually youthful (hey it’s her dream, she can write it however she wants) mom to 2 fluffy cats, with a husband who’s 50-something-going-on-15, was born in Minnesota, and has tried to move away a couple of times but somehow seems to be bungie-corded to the state as she still lives there, despite having a heart that longs for the warm ocean of the Caribbean Sea. She’ll write on her blog fairly regularly as long as her fingers don’t freeze from the bitter year round cold they experience there, (or at least that’s what everyone in California thinks). In addition to trying to become self supporting in one of her avocations, she's also an RN, Project Manager, and herder of cats. Click to enter your email for an easy way to learn about new blog posts from me.